At the end of the Synod of Bishops meeting on the ‘New Evangelization for the Transmission of the Christian Faith’, Pope Benedict XVI explained that his choice of the new Cardinals was to express the universality of the Church, showing that the Church is the Church of all peoples, that she speaks all languages, that she is always the Church of Pentecost; not the Church of one continent, but the universal Church. My intention was to express this universality of the Church. It will also be a fine expression of this Synod. I have found it truly edifying consoling and encouraging to see here the mirror of the universal Church, with her suffering, threats, dangers and joys, her experiences of the Lord’s presence, even in difficult situations. One of the new Cardinals is Archbishop John Olorunfemi Onaiyekan of Abuja, Nigeria. 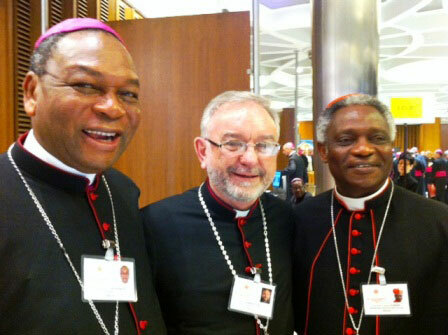 He is pictured here on left with Bishop Kieran O’Reilly SMA of Killaloe and H E Peter Cardinal Turkson (from Ghana) who is President of the Pontifical Council for Justice and Peace. Read more about Cardinal Onaiyekan. The first concerns the Sacraments of Christian initiation. It has been reaffirmed that appropriate catechesis must accompany preparation for Baptism, Confirmation and Eucharist. The importance of Confession, the Sacrament of God’s mercy, has also been emphasised. … In fact it has often been said that the real protagonists of the new evangelisation are the saints: they speak a language intelligible to all through the example of their lives and their works of charity. “Secondly, the new evangelisation is essentially linked to the ‘Missio ad Gentes’. The Church’s task is to evangelise, to proclaim the message of salvation to those who do not yet know Jesus Christ. During the Synod, it was emphasised that there are still many regions in Africa, Asia and Oceania whose inhabitants await with lively expectation, sometimes without being fully aware of it, the first proclamation of the Gospel. So we must ask the Holy Spirit to arouse in the Church a new missionary dynamism, whose protagonists are, in particular, pastoral workers and the lay faithful”. “A third aspect concerns the baptised whose lives do not reflect the demands of Baptism. … Such people are found in all continents, especially in the most secularised countries. The Church is particularly concerned that they should encounter Jesus Christ anew, rediscover the joy of faith and return to religious practice in the community of the faithful. Besides traditional and perennially valid pastoral methods, the Church seeks to adopt new ones, developing new language attuned to the different world cultures, proposing the truth of Christ with an attitude of dialogue and friendship rooted in God Who is Love”.